5G is coming, in a big way – but what exactly is 5G, when will you be able to get it, and which devices will you need to take advantage of it? Here we're going to explain everything you need to know about 5G in the UK so you can get right up to (super-fast) speed. The new 5G standard promises a generational leap in terms of upload and download speeds, and we're already seeing 5G phones appear. As with any new technology though, the details can be difficult to get your head around, which is why we're here to help. 5G in the UK: what is 5G? Like 4G before it, 5G represents a leap in terms of the upload and download speeds you can expect over a cellular connection. The exact speeds will vary depending on your device and signal strength, but data transfer rates should be vastly improved – so movies download in seconds rather than minutes. 5G is about more than just pure speed though: it's also about increased capacity and bandwidth. In other words, you shouldn't lose signal as easily when you're on a crowded train platform or sat at a football match. This greater capacity means more devices, from self-driving cars to home sensors, can be connected more of the time. The radio waves that 5G uses to ferry 1s and 0s through the air are more compact than those used by 4G, which means more data packed into a tighter space. Even better, 5G chips and antennas should be more compact and lightweight than their 4G predecessors, thanks to improvements in manufacturing technology. 5G in the UK: what phone do I need? To take advantage of these ultra-fast speeds, you're going to need to upgrade your handset – a new 5G modem inside your phone is required to connect to 5G networks, and in 2019 we're starting to see the first 5G phones hit the UK. These phones will fall back to 4G or slower connection speeds whenever 5G isn't available. At the moment the choice of 5G phones is rather slim, but more and more of these phones will start to appear over time. The Samsung Galaxy S10 and Samsung Galaxy Fold both have 5G models available, and the Huawei Mate X has 5G on board too. The Xiaomi Mi Mix 3 is 5G-ready as well, and can be yours for £520. Plenty more 5G phones are on the way: the OnePlus 7 and the Huawei P30 are expected to come with 5G on board, while Sony's next flagship (the follow up to the Xperia 1) is also being tipped to come with the next-gen technology. Unfortunately for Apple fans, 5G might not hit the iPhone until 2020. Even when you've got a 5G phone in your possession, you still need a 5G network to connect it to. O2 has said that it's going to start rolling out 5G technology during 2019, though it hasn't gone into too many specifics on the timing or speed of the roll out. London, Belfast, Cardiff and Edinburgh will be the first cities to get the upgrade. If you don't live in one of those cities, your wait is going to be slightly longer – O2 seems to want to wait for the mobile devices to hit the market first. "Other areas of the UK will enjoy roll out from 2020 to coincide with the wider availability of 5G handsets," according to the official press statement. Like O2, EE is going to start its roll out of 5G during 2019, though again it's going to be limited to begin with. During the second half of 2019 the 5G push is going to cover London, Edinburgh, Cardiff, Birmingham, Manchester and Belfast to begin with. EE says that busy areas like airports and shopping centres will be targeted first. Ten more cities are going to join the 5G party before the end of the year: Glasgow, Newcastle, Liverpool, Leeds, Hull, Sheffield, Nottingham, Leicester, Coventry and Bristol. EE is also supporting the HTC 5G Mobile Smart Hub, which can serve up 5G speeds to other devices in your home. We know that Three is going to be supporting the HTC 5G Mobile Smart Hub as well as EE, and it too has said it'll take the first steps towards rolling out 5G infrastructure in 2019. Details are a bit thin on the ground but we do know upgrades are coming in the second half of the year. Where those upgrades will be, we don't know yet, though Three is making positive noises about getting the next-generation tech up and running. If you're on Three or on a network that piggybacks on top of the Three infrastructure, you should eventually be able to get some of the fastest 5G around. Last but not least, Vodafone is bringing 5G to its UK network during the second half of 2019. Salford, Bristol, Cardiff, Liverpool, Birmingham, Glasgow, London, Birkenhead, Blackpool, Bournemouth, Guildford, Portsmouth, Plymouth, Reading, Southampton, Stoke-on-Trent, Warrington, Wolverhampton and Newbury are first in line. 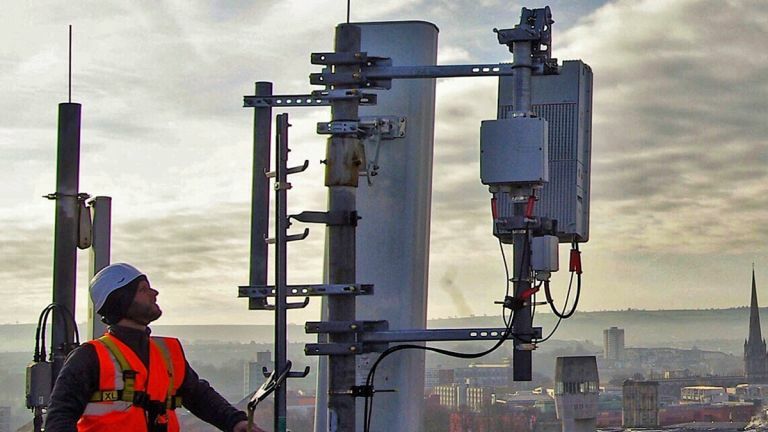 Vodafone was one of the first major players to start testing 5G technologies, bringing 5G to Manchester Airport earlier this year. More "travel hotspots" are going to be popping up around the country throughout the year as 5G becomes more widespread, Vodafone has said.